On weekends we often structure our meals to replicate the courses of a traditional Italian meal. By this I mean a small appetizer course, followed by a pasta course and then the meat course served with a vegetable. Eating like this allows for both a small pasta and a meat course without feeling completely overwhelmed by the food. For example, a recent feast at our house started with some warm marinated olives, followed by a cold gnocchi caprese, and a porchetta with a side of broccoli rabe. Though gnocchi can often be quite heavy serving it as a starter is a great way to not stuff yourself. I found the recipe below on With Salt & Wit and other than using homemade gnocchi and plain mozzarella I didn't change much. Cook gnocchi, drain and toss with olive oil. Place in fridge to chill at least an hour. Once cold toss with cherry tomatoes, mozzarella and basil. Season with salt and pepper and drizzle with balsamic glaze. I have never eaten gnocchi cold but it sounds great in this salad! I absolutely love these classic caprese flavors! Cold gnocchi salad? Count me in! 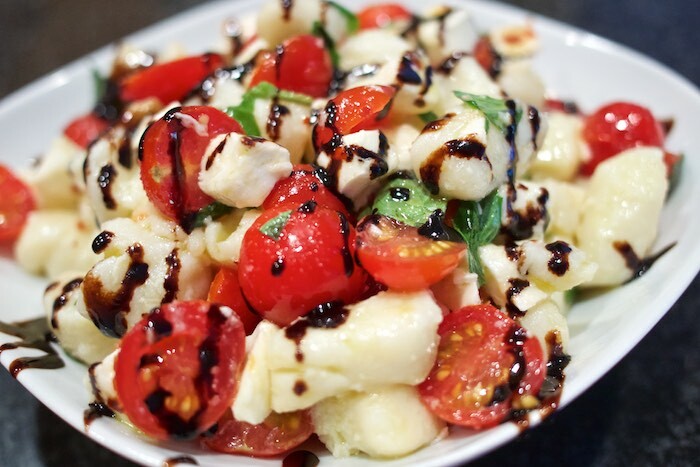 I love a caprese salad and adding cold gnocchi to the mix sounds amazing! This looks delicious! Love the flavors going on! That sounds delicious, great idea! I've never thought of using gnocchi in a salad like this before, great idea! Oh I just love gnocchi and usually eat it warm but it sounds amazing in a cold salad. Great combination of flavors!! This looks seriously delicious. I could eat this for breakfast, lunch, and dinner. Yum! Never tried cold gnocchi ,but this one looks interesting to try! I love gnocchi hot or cold! I know we'd love this! Might have to try it out this weeekend! You are really speaking my language here. Olives, gnocchi, porchetta....OMG!! This and a glass of wine...and I would be a very happy camper...and full too!! Oooooh, I've never eaten gnocchi cold either but this recipe looks and sounds delicious! Can't wait to give it a try!